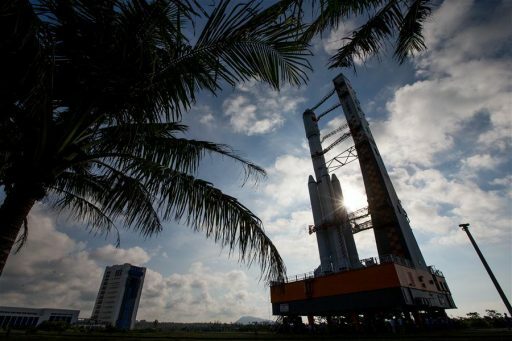 China’s Long March 7 rocket was moved to its launch pad on Hainan Island on Monday for the country’s first orbital logistics mission, setting out to prove critical technologies for the upcoming Chinese Space Station (CSS) that will begin deployment in 2018 to build a permanent Chinese outpost in orbit. 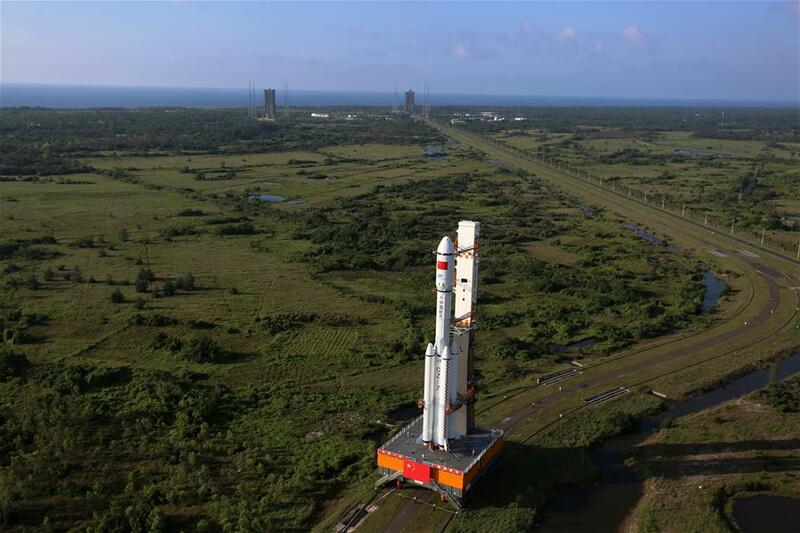 Long March 7 is set for liftoff from the Wenchang Satellite Launch Center at 11:40 UTC on Thursday to begin a ten-minute climb to dispatch the Tianzhou-1 cargo vessel on a shakedown mission to the Tiangong-2 space station module. 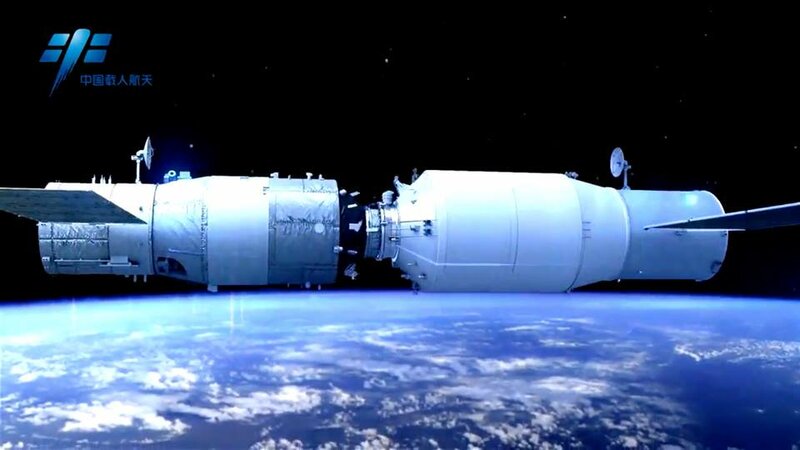 Over the course of a five-month mission, Tianzhou-1 is planned to conduct three separate dockings to the Tiangong target vehicle, demonstrate autonomous navigation, in-space propellant transfer and orbital mechanics for an expedited rendezvous scheme to be employed by future crew missions. 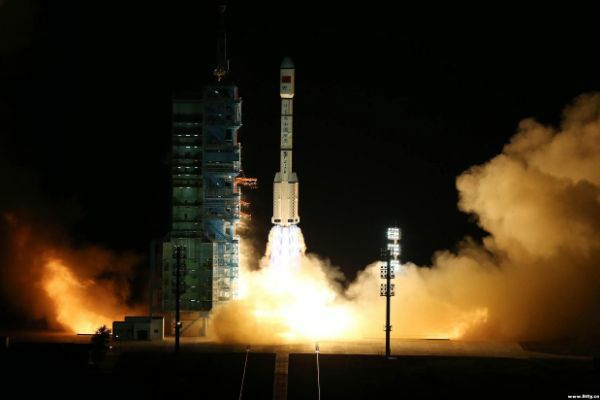 Thursday’s launch marks only the second flight of the Long March 7 rocket which debuted on June 25, 2016 when it successfully lifted a scaled model of China’s future crew spacecraft. The CZ-7 launcher is part of China’s new line of rockets that is slowly ramping up operations to eventually take over from the country’s antiquated rocket generation that relies on old-space technology such as toxic self-igniting propellants. Offering a higher performance and using environmentally friendly Kerosene/Liquid Oxygen propellants, China’s new rockets can support heavy hauls to Low Earth Orbit for the deployment of a large modular space station, lift heavy communications satellites to Geostationary Orbit and support China’s ambitions in robotic exploration of the Moon and Mars. Tianzhou, Chinese for ‘Heavenly Ship,’ is China’s primary logistics spacecraft planned to service the Chinese Space Station by delivering pressurized cargo, external payloads and refueling propellant to the complex at a regular schedule to keep a permanent crew of three stocked up on supplies and deliver new science to the complex. The craft itself is largely based on the design of the Tiangong space station modules that launched in 2011 and 2016 as stepping stones toward the larger CSS, demonstrating critical technologies and operations needed for sustaining a large space station. Tianzhou is around ten meters long and its cargo compartment is 3.35 meters in diameter, holding up to 6,500 Kilograms of supplies. 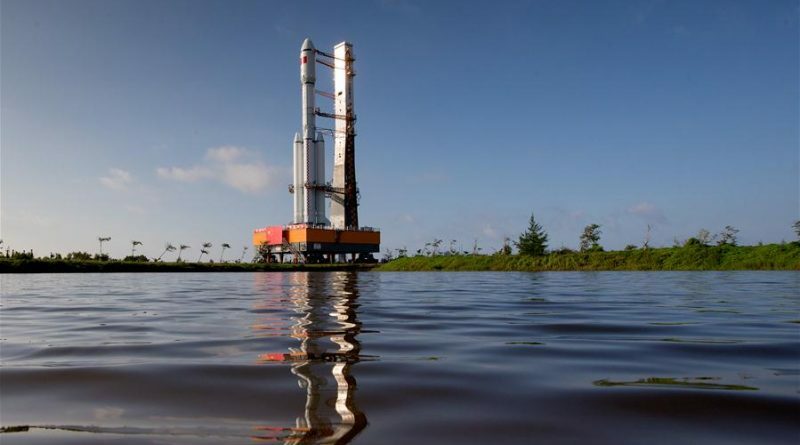 The craft can be flown as a fully pressurized vehicle, carrying only internal cargo, as a semi-pressurized version with internal and external payloads and an unpressurized version will enable large external payloads to be delivered to the Chinese Space Station. 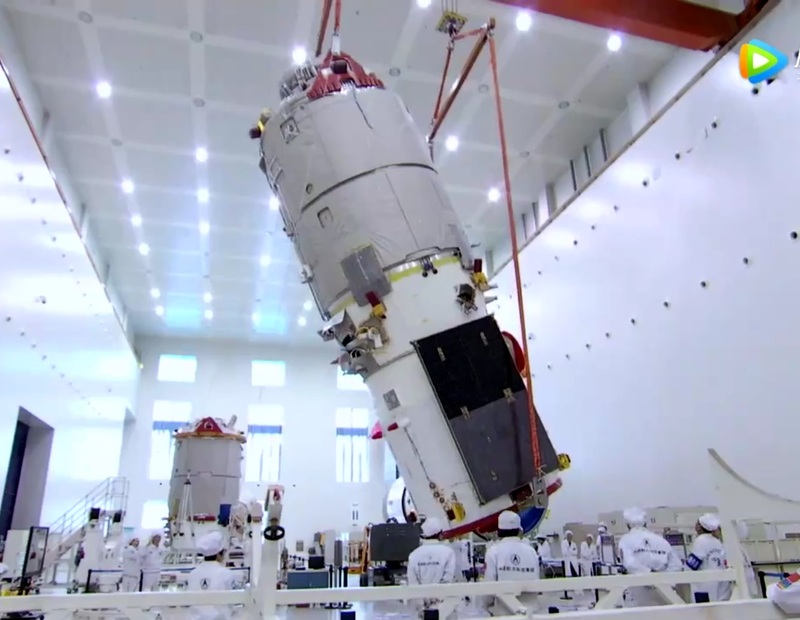 The Tianzhou-1 mission is dedicated to a full demonstration of China’s orbital cargo architecture with special focus on the transfer of propellants from the resupply craft to its target vehicle. 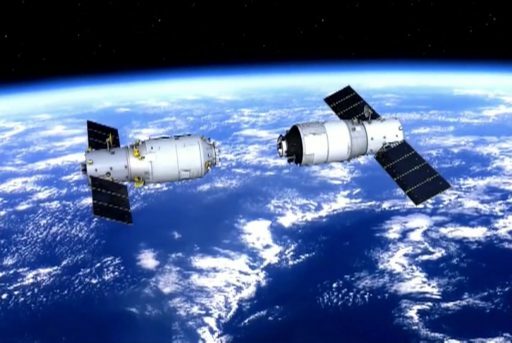 Lifting off on Thursday, the 13,500-Kilogram spacecraft will link up with Tiangong-2 for a fully automated docking ahead of a stay of several weeks, facilitating an initial demonstration of in-orbit refueling. In total, the mission will attempt three docking maneuvers and Tianzhou-1 will spend around two months in free flight. Toward the end of the flight, a fast-track approach to Tiangong-2 will be demonstrated to assess whether future crew flights can make use of a same-day rendezvous profile. 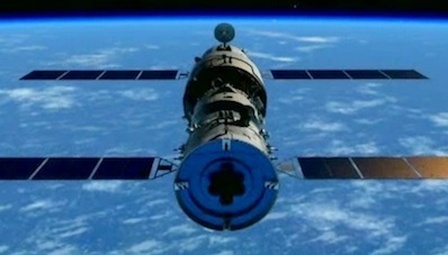 Tiangong-2 has been in orbit since September 16, 2016 and was visited by the Shenzhou-11 spacecraft in October, bringing Astronauts Jing Haipeng and Chen Dong to the space lab for China’s longest crewed mission to date. Over the course of a month-long stay aboard Tiangong-2, the two crew members worked through dozens of scientific experiments and demonstrated in-space habitation over an extended mission duration. 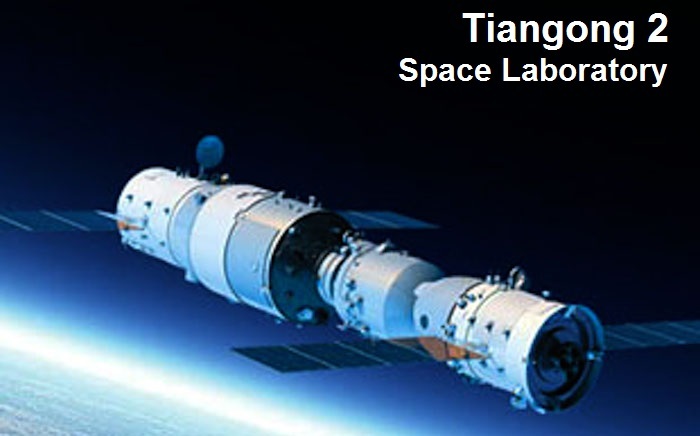 The visit of Tianzhou-1 is the second major objective of the Tiangong-2 mission, acting as a target for China’s first orbital cargo delivery. In early April, Tiangong-2 maneuvered from a 374 x 382-Kilometer orbit into a slightly higher orbit of 379 by 391 Kilometers to set up the proper orbital geometry for its rendezvous with Tianzhou-1. 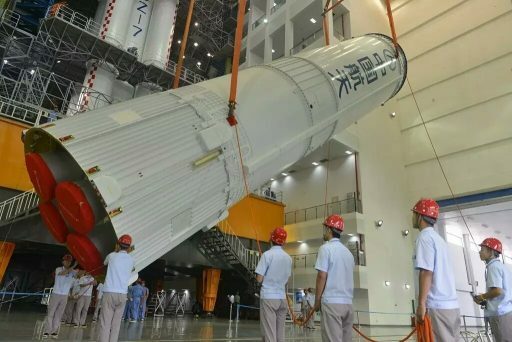 Preparations for the Tianhzou-1 mission picked up at the Wenchang launch base in early March with the delivery of the Long March 7 rocket. In the following weeks, Long March 7 was assembled by stacking its two 3.35-meter diameter stages and adding four liquid-fueled boosters to the first stage before the encapsulated spacecraft was hoisted atop the rocket. Acceptance tests cleared the way for Monday’s rollout to Launch Pad 201. Liftoff is timed for precisely 11:40:45 UTC on Thursday, 7:40 p.m. local time to enable Long March 7 to send its heavy payload directly into the orbital plane of the Tiangong-2 spacecraft. Firing up its core stage with twin YF-100 engines and four boosters, each with their own YF-100, Long March 7 will rise with a total thrust of 722 metric-ton-force. After a brief vertical climb, Long March 7 will pitch and roll onto a south-easterly departure path, heading into the night as it passes the speed of sound just over one minute into the mission. The four boosters will burn for approximately 175 seconds, in the process consuming around 75 metric tons of Liquid Oxygen and Kerosene propellants each. Once the 26.5-meter long boosters have dropped away, the core stage will make a brief stabilization maneuver and continue firing for another 12 seconds before it too will shut down its twin engines after burning some 170 metric tons of propellants. The 26-meter long core stage will separate from the rocket immediately after shutdown, followed seconds later by the ignition of the second stage’s four YF-115 staged combustion engines that will push the stack into orbit with a thrust of 73,400 Kilogram force. Three minutes and 35 seconds into the flight, the 4.2-meter diameter payload fairing will split open and drop away from the Tianzhou spacecraft after the stack departed the dense layers of the atmosphere. The second stage will be in action for around six minutes and 42 seconds to lift the vehicle into orbit. No target orbit parameters were given – the typical injection for rendezvous mission by China’s Shenzhou craft is 200 by 330 Kilometers, Tianzhou will likely use a similar orbit. Separation of the Tianzhou spacecraft is expected just shy of ten minutes into the flight, using its own thrusters to pull away from the second stage of the launch vehicle. 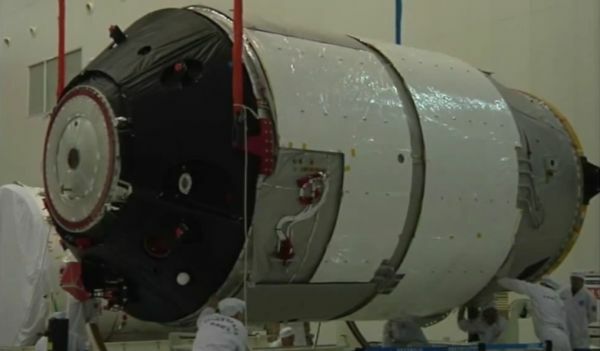 After arriving in orbit, Tianzhou-1 will stabilize its orientation, establish a connection through the Tianlian data relay satellites and deploy its two power-generating solar arrays. A series of main engine burns will maneuver the spacecraft to the vicinity of Tiangong-2 for a fully automated rendezvous using laser and radio guidance systems. Tianzhou-1 will stay in orbit for around five months to complete its demonstration mission before ending its flight with a destructive re-entry. 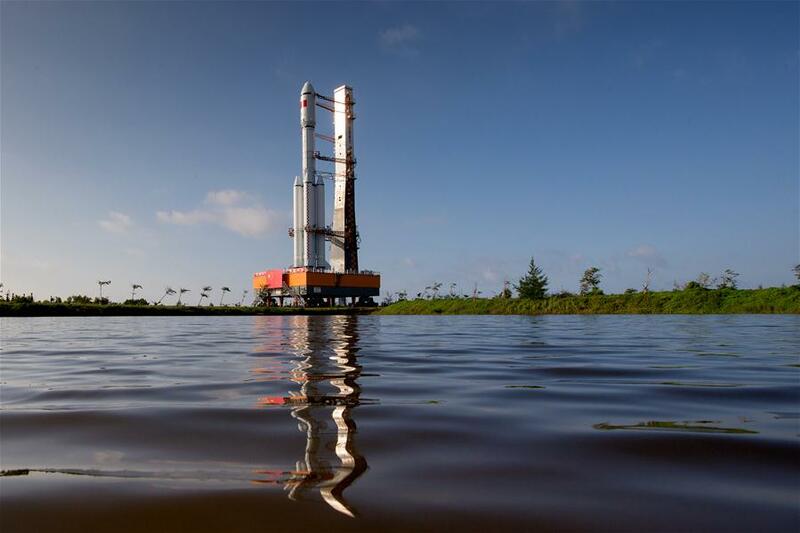 Tianzhou-1 has a backup launch slot at 10:20 UTC on April 23 should Thursday’s launch not be possible due to technical reasons or unfavorable weather. The weather outlook for Thursday shows a risk of moderate precipitation and isolated thunderstorms moving through the area in the afternoon hours, but weather is expected to calm down closer to the planned launch time under one hour after sunset.